Welcome to SooriyaArt.com the official website of Copper Artist Sooriya Kumar. 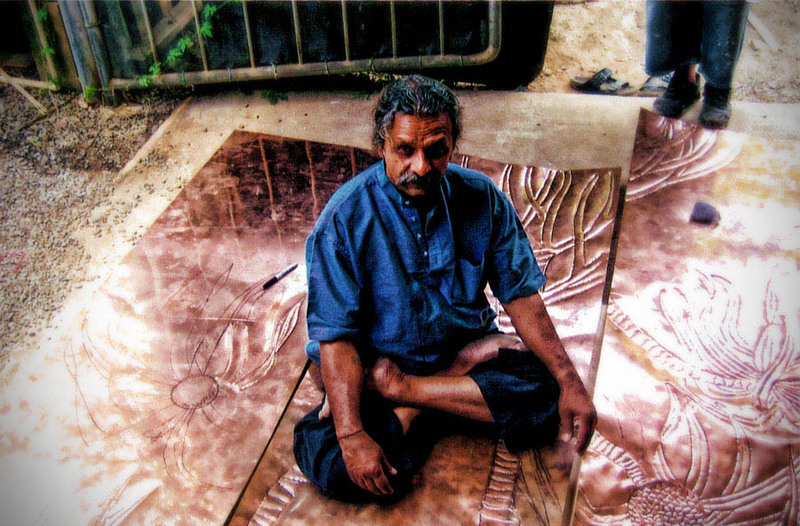 The website showcases the copper artworks of Sooriya Kumar, master copper artist from Sri Lanka. Good morning, We all had a great time on your ranch/farm last night.Would like to see everything in daylight. ? Thank you for your kindness, Ben’s brother-in-law Glyn & wife Malissa ( lady with cane). Have a beautiful day. Greetings, Sooriya! You are so gifted and your work is so stunning. I just love many of your sacred art pieces. Do you sell your work?! Such a blessing! Have a wonderful day! Thanks for the wonderful evening with you and Amalia, Rich and Rosalyn, and your other guests from San Francisco last week. We so appreciate and enjoy your art at the Comp Center, and your farm is a natural extension of that art. You are truly an exceptionally blessed artist. See you on our next trip. Please give our regards to Amalia. It was a pleasure meeting you today (4/30/15) at Hawaii Chemical & Scientific and learning about your art. Look forward to enjoying the art you produce. Also learning more about Mouna Farms – Arts & Culture Related.